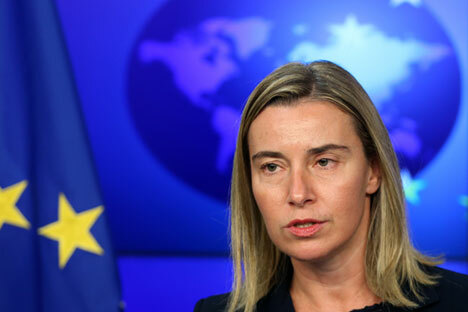 High Representative of the European Union for Foreign Affairs and Security Policy Federica Mogherini. None of the European Union’s member states has proposed introducing sanctions against Russia because of the Syrian crisis, High Representative of the European Union for Foreign Affairs and Security Policy Federica Mogherini said on Oct. 17. "This is not being proposed by any member state. I’ve seen this has been very much on the media but not in our meetings. In none of our meetings this issue was raised by any member states," Mogherini said ahead of the EU Foreign Affairs Council in Luxembourg. "But we have sanctions on the Syrian regime," she said, adding that sanctions was not the only instrument in the European Union’s toolbox. "Today the main issue with which we will work is obviously Syria. I will propose to the ministers some ideas on why and how the European Union can support more and better the work on the future of Syria," Mogherini said. She said the Syrian crisis will be discussed together with UN Special Envoy for Syria Staffan de Mistura who had been invited to the Luxembourg meeting. "The European Union is not a military player on the ground in Syria … but we encourage and we support all initiatives that lead or can lead to a cessation of hostilities," Mogherini said.